Drive system engineers develop market-competitive and innovative equipment by replacing roller chain drives with synchronous belt drives. 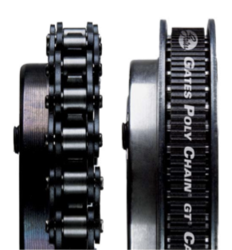 Gates Poly Chain® GT® CarbonTM belt drive can match the load capacity of a roller chain drive width-for-width in almost any application. Design engineers typically design synchronous belt drives over roller chain for a longer life – an average of over three times the typical life of a roller chain drive – as well as the fact that they require no lubrication and are much quieter. Gates Corporation, a leading manufacturer of industrial and automotive products, offers a new white paper, “Synchronous Belt Drives: Designed for Roller Chain Applications,” to help design engineers develop market-leading industrial equipment. Benefits of synchronous belt drive solutions include matched roller chain performance and reduced weight, mess and maintenance. “Design engineers typically design synchronous belt drives over roller chain for a longer life – an average of over three times the typical life of a roller chain drive – as well as the fact that they require no lubrication and are much quieter,” said Alan Romagnolo, Synchronous Product Line Manager at Gates Corporation. Synchronous belt technology has evolved dramatically to improve a wide range of power transmission applications, and the white paper dispels the misconception that synchronous belts are incapable of performing the work of roller chain drives. The paper addresses design engineers’ common concerns about replacing roller chain with synchronous belts in their drive system designs. Modern synchronous belts offer high load carrying capacity and can replace chain width-for-width in sizes #35 to #180 and higher. In addition, the use of backside or outside idlers gives design engineers flexibility in fitting a synchronous belt drive into a compact drive package with fixed or limited center distance adjustment. To download the free white paper, visit gates.com/rollerchain. For more information, please contact Mari Jane Panek at 303.744.4533. Gates Corporation (gates.com) is one of the world’s leading manufacturers of industrial and automotive products, systems and components with operations in 30 countries. Gates maintains sales and marketing operations in every major industrial and automotive market, including North and South America, Europe, Asia, Australia and the Middle East. Gates is part of the Industrial & Automotive group of Tomkins Ltd., which is owned by a consortium comprising Onex Corporation and the Canada Pension Plan Investment Board. Tomkins enjoys strong market positions and technical leadership across all of its business activities and owns some of the best-known brands in their respective markets.